“Line Up” at DC Moore Gallery, installation view courtesy of the gallery. More than 20 artists are presented in this show, crowded into a small room off the main space of the main gallery. Luminaries include Romare Bearden, Edward Hopper, and Franz Kline, along with a host of not-quite-so-famous artists. “Line Up” is the sort of show that is produced to accommodate the long, slow summer months, but it is by no means an exhibition that merely fills space. 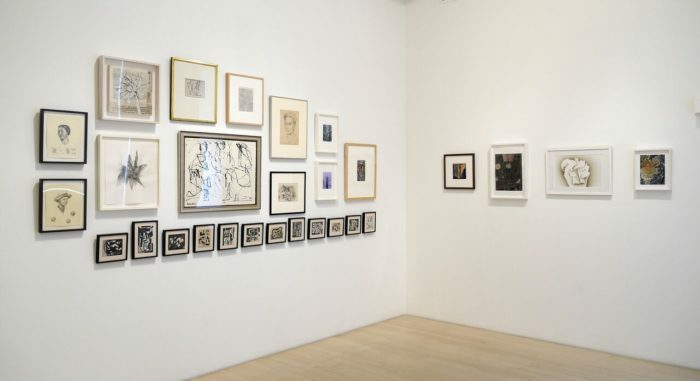 The many works on paper available in this excellent presentation of mostly smallish works attest to a medium whose reputation remains relatively minor, despite the fact that the kind of art shown is ambitious, more than technically sound, and very alive to the currents of the time they were made in. Somehow, for some unexplained reason, works on paper are treated as the poor cousins of painting, but this is missing the point. 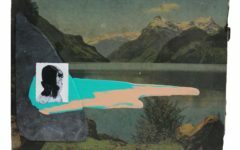 It is much more accurate to see the genre in its own right–enabling an expressiveness based on improvisation and spontaneity, unlike an oil painting, which can be reworked over a good deal of time. 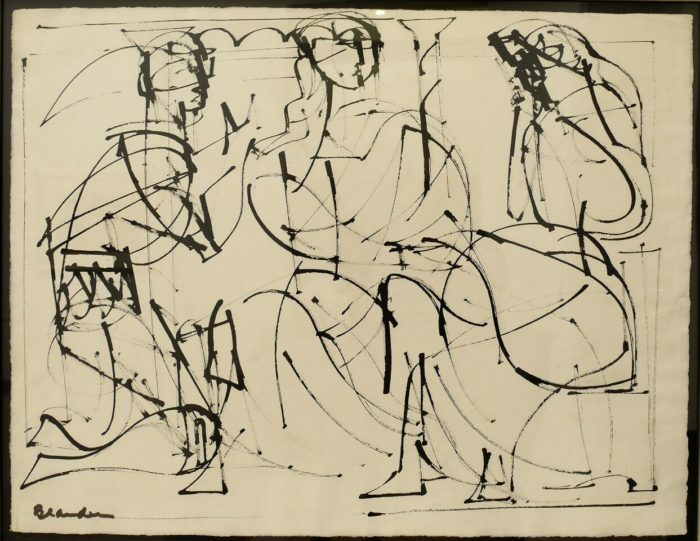 “Line Up” thus offers examples, mostly small in dimensions, that involve the exquisite consideration of form–both abstract and figurative works are available for viewing. 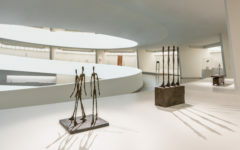 While the works are small and installed in a populous fashion–the space is quite small–individually and cumulatively they create an atmosphere of undiluted creativity, given the examples’ variety of form, subject, and intention. “Line Up,” then, is the kind of show that we tend to see in the summer months, but which actually deserves as wide an audience as possible, at a time when the city populace hasn’t left for the beaches! 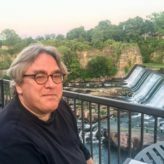 D.C. Moore’s historical holdings are extensive, and many of the artists we see here are affiliated with the gallery. I think this fine gathering will demonstrate not only the creative longevity of the genre, but also the depth of the gallery’s roster. Romare Bearden, Untitled from The Iliad Series, 1948-1952, ink on paper, 25 ½ x 19 ¾ inches. 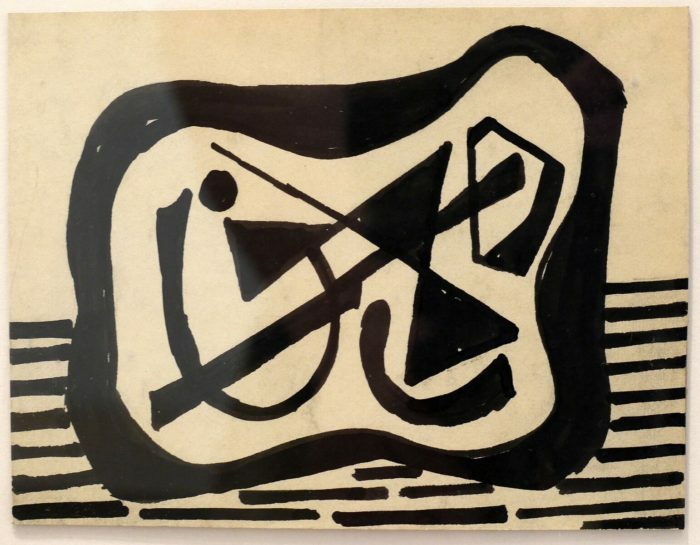 Vaclav Vytlacil, Untitled #1480, c. 1937, ink drawing signed on verso, 5 3/8 x 7 inches. For this writer, by far the most immediately arresting image (without a title) was done by Romare Bearden, something that looks very much like an abstraction. Painted during the years 1948 to 1952 for his “Iliad Series,” this seeming abstraction also suggests a phalanx of spears–the means of defense the Greeks use in the great epic poem. At once an inspired abstract work, filled with thin, black lines that could easily be read as Bearden’s version of abstract expressionism, as well as a description of the objects of Greek defense, this painterly drawing, the largest piece in the show, presents a message of high intuitive thinking, high culture, and high skill. 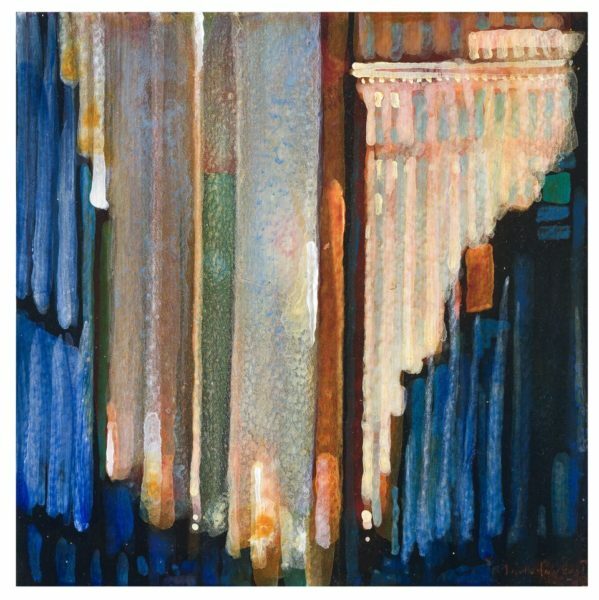 There are also more than a few examples of an abstract series, untitled, by the Czech-American artist Vaclav Vytlacil; the sequence, small in dimensions, records a very sophisticated intelligence and hand. His abstraction proceeds from cubism but does not succumb to that style. In the three examples presented here, all from circa 1937, we see a highly sensitive, but also forceful, sensibility: in all three of the prints, the imagery consists of abstract forms, which lean generally toward organic shapes. The elements are arranged with great precision, mixing measure with anarchic freedom, and occupy their space aggressively, leaving viewers with the feeling that, despite their small size, these ink drawings are communicative of large form and feeling. Whitfield Lovell, Untitled (card drawing), 2000, charcoal on paper, 10 1/8 x 8 1/8 inches. Paul Cadmus, portrait, 1932-33, pencil on paper, 12 ¼ x 9 inches. 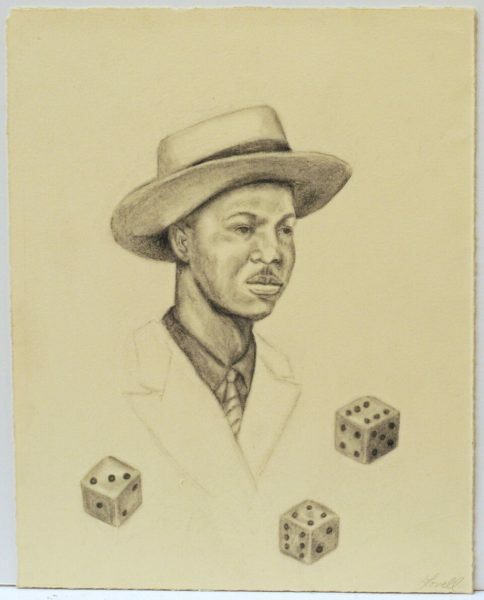 On the figurative side, Whitfield Lovell offers two examples of his “Card Drawings” series–one, done in 2000, of a black man with a mustache, in a hat and wearing a tie and suit jacket. Underneath him are three dice–a reference to the limitations of chance. The other drawing, of a black woman (no date) presenting soft features and smiling eyes and mouth, communicates her humanity in conventional but also warmly expressive terms. Four playing cards lie below her visage–another reference to happenstance and fate. Lovell’s technical ability here is unquestioned; he shows authority and a good command of the medium of drawing. The references to fate–the dice and the cards–add gravitas to the straightforwardness of the renderings. 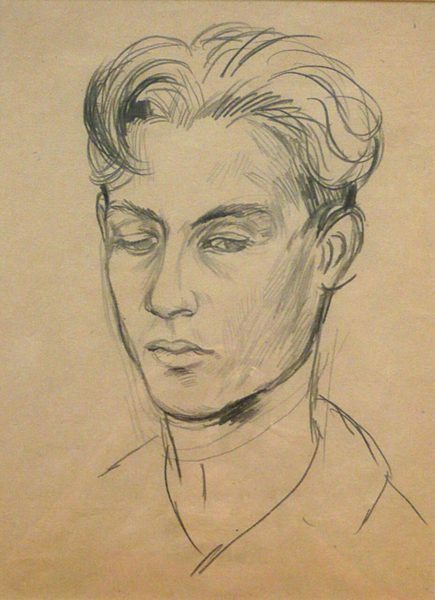 Another pencil drawing, Portrait (1932-33), by Paul Cadmus is a forthright view of a handsome young man, with touseled hair, a downward gaze, and sharply cut features. Like Lovell’s drawings, the strength of this piece is based on excellent observation and a very clean line. While the work is hardly new, either technically or thematically, it maintains a considerable level of skill and succeeds fully in a genre established for centuries. Given that our penchant for improvisation is so considerable, it becomes easy to regard traditional technique as studied, Lovell and Cadmus’s drawings remind us just how effective supposedly conventional rendering can be. Edward Hopper, Study for Pennsylvania Coal Town, 1947 Charcoal on paper, 11 ¾ x 8 ½ inches. 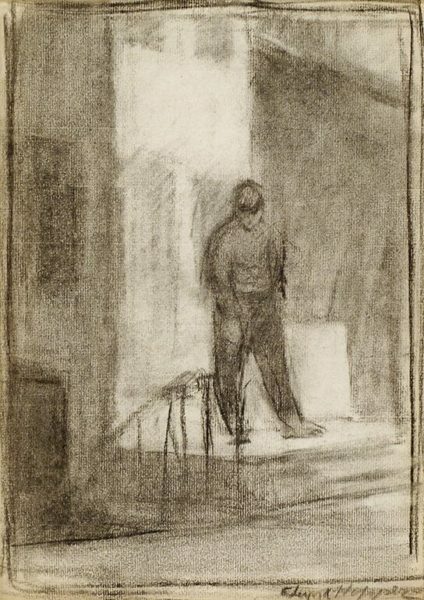 Hopper’s small drawing, Study of Pennsylvania Coal Town (1947), is an affecting, if also simple, view of a man standing on the landing of a white building with two darker buildings on either side. On the man’s right is an angled iron fence; the figure has dark rings for eyes–to the point where he seems to be wearing a mask–and has his hands in his pockets. Without the title specifying the location, we would not know where the person is stationed. The mood and imagery are unspecific; it is very difficult to read the face’s expression. But that does not stop the study from achieving what Hopper does best: an atmosphere in which much beyond the subject is implied, usually of a grave nature. 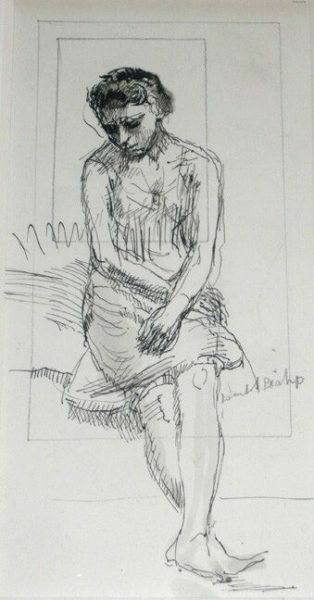 Isabel Bishop, Woman Dozing FF193, c. 1945, ink on paper, 6 x 3 inches. Isabel Bishop’s exquisite pencil drawing takes place on a blue paper background; wearing a simple chemise, a young woman sits dozing upright on a bed. 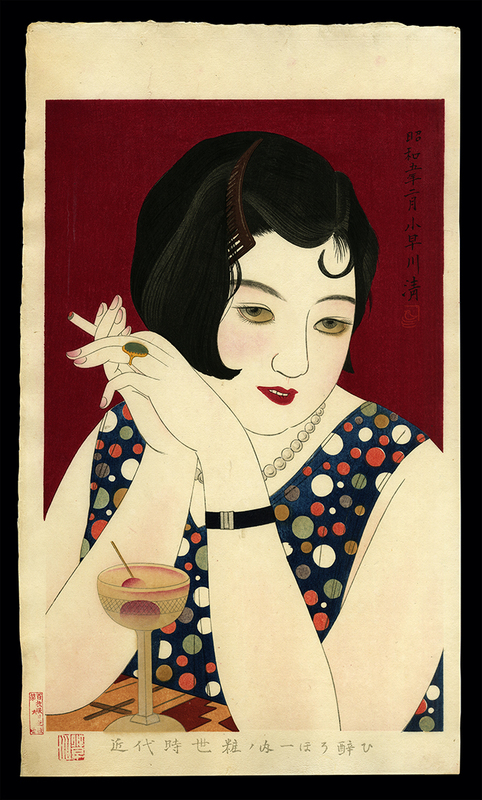 Short-haired, with crossed arms, her hands landing in her lap, the figure emanates a gravitas that brought about by her closed, deep-set eyes. Despite the supposed ephemeral nature of the medium Bishop has chosen, the image conveys considerable weight. We have no idea whether the woman’s circumstances are tragic, or even marginally troubled, but we appreciate the seriousness of the image. Mark Innerst Locust, 2011, acrylic on paper, 6 x 6 inches. Barbara Takenaga, Untitled (Belinda), 2016, acrylic on paper, 9 x 7 inches. The last two works to be discussed are two color abstractions. Locust (2011), by Mark Innerst, is an acrylic painting, six inches square. It consists of stripes of different colors that don’t quite reach the bottom of the field–blue on the left, shades of gray and brown in the middle, and, on the right, white lightly tinted with pink (and supported by dark-blue stripes beneath them). The whitish part feels like a tall building with uninterrupted vertical windows, but otherwise, it is an excellent abstract study, structural in its presentation. 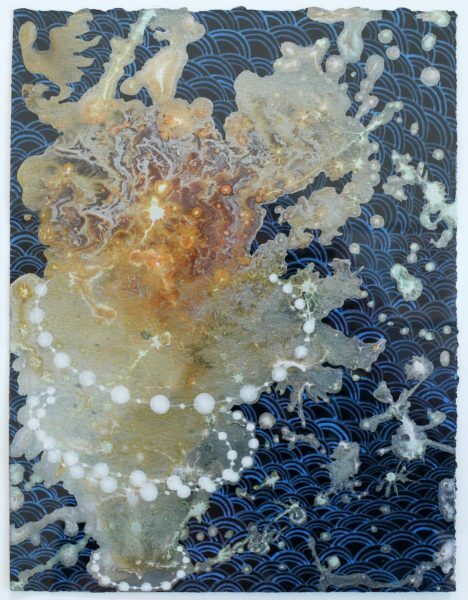 Barbara Takenaga’s offering, called Untitled (Belinda) (2016), is an elegant abstraction taking place within small dimensions: nine by seven inches. On the left is an expanding geyser in white, moving into greater fullness as it makes its way upward. Three pearl-like rings encircle it. On the right is an uninhibited, variously expressed accretion of splatters that fall on top of the general background of dark blue, which is covered with upward-directed semicircles of a lighter blue. The blue part is covered with half circles, placed in rows on top of each other (seeing them is a bit like watching waves in the sea). The crown of the geysers is partially golden as if to emphasize the royal nature of the jet. Throughout this excellent show, the viewer finds out that strong work, figurative or abstract, need not be constrained by limited dimensions. The broad variety of the artists, including persons who are Asian and black and white, underscores the fact that both new and old work is being made, and has been made, by highly gifted artists whose main concern is not to edify or instruct, but rather to delight. Here they indeed achieve their aim, in the expanses of their chosen medium.